Strong bonds form stronger materials. For this reason, the investigation on thermal degradation of materials is a significantly important area in research and development activities. The analysis of thermal stability can be used to assess the behavior of materials in the aggressive environmental conditions, which in turn provides valuable information about the service life span of the materiel. Unlike other books published so far that have focused on either the fundamentals of thermal analysis or the degradation pattern of the materials, this book is specifically on the mechanism of degradation of materials. The mechanism of rapturing of chemical bonds as a result of exposure to high-temperature environment is difficult to study and resulting mechanistic pathway hard to establish. Limited information is available on this subject in the published literatures and difficult to excavate. 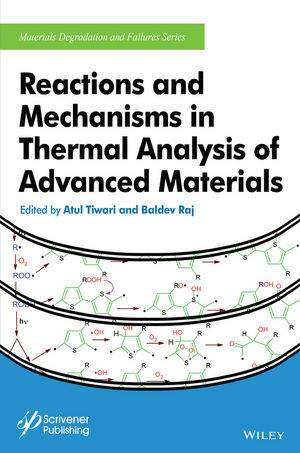 Chapters in this book are contributed by the experts working on thermal degradation and analysis of the wide variety of advanced and traditional materials. Each chapter discusses the material, its possible application, behavior of chemical entities when exposed to high-temperature environment and mode and the mechanistic route of its decomposition. Such information is crucial while selecting the chemical ingredients during the synthesis or development of new materials technology. Dr. Atul Tiwari is a research faculty member in the Department of Mechanical Engineering at the University of Hawaii, USA. He has received Ph.D. in Polymer Materials Science along with the bestowed Chartered Chemist and Chartered Scientist status from the Royal Society of Chemistry, UK. Dr. Tiwari is an active member of several professional bodies in the UK, USA, and India. Being an organic chemist and mechanical engineer his research work tends to bridge the gap between the science and engineering. Dr. Tiwari has published more than sixty peer reviewed research publications. His area of research interest includes the development of smart materials including silicones, graphene and bio-inspired biomaterials for industrial applications. Dr. Tiwari zeal to develop new materials and has generated six international patented/pending technologies that have been transferred to the industries. He is an active consultant to renowned companies and acts as associate editor of international journals. Baldev Raj is a distinguished scientist and former director of Indira Gandhi Centre of Atomic Research, India. He has pioneered the application of Non Destructive Testing (NDT) for basic research using acoustic and electromagnetic techniques in a variety of materials and components. He is currently President, International Institute of Welding, President, Indian National Academy of Engineering and President-Research PSG Institutions, Coimbatore. He is a member of the Scientific Advisory Council to Prime Minister, Scientific Advisory Council to Cabinet, Nano Mission Council of India and Apex Advisory Committee, Ministry of Human Resources Development. He is Chairman, Board of Governors, IIT, Gandhinagar & NIT, Puduchery.